천문 정보, 천문 자료, 별자리, 태양, 달, 행성, 소행성, 왜행성, 왜소행성,유성, 유성우, 혜성, 은하수, 우리 은하,태양계,천체 사진, 천체 동영상, 천문 동영상,인공 위성 사진,이리듐 플레어,국제우주정거장,ISS,천체 사진 촬영법, 이미지 프로세싱 팁, 장비 리뷰 및 팁 제공. 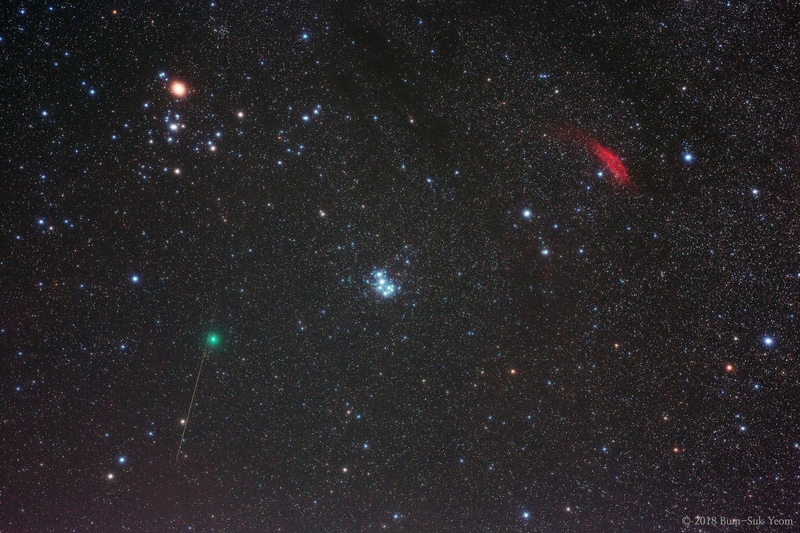 RGB color and Geminids in nightsky. 밤하늘의 RGB 컬러와 쌍둥이자리 유성우. The RGB color is Red(California nebula NGC1499), Green(Comet Wirtanen), and Blue(Nebula of the Pleiades cluster M45). We can also see the Geminids, a yellowish Aldebaran, and the Hyades cluster. RGB 컬러는 적색(캘리포니아 성운 NGC1499), 녹색(위르타넨 혜성), 그리고 청색(플레이아데스 성단 M45의 성운)입니다. 또한 혜성옆을 스치고 지나가는 쌍둥이자리 유성우, 알데바란, 그리고 히아데스 성단도 볼 수 있습니다. 6분 노출한 한장짜리 사진입니다. 염범석 (Bum-Suk Yeom). Taken by Bum-Suk Yeom on December 14, 2018 UTC @ Jangsu, South Korea. Details: 16:55 UTC (01:55 December 15 KST), Sigma Art 50mm lens with EOS 5D Mark III camera, SkyGuider mount, Optolong L-Pro filter, Lee soft no.1 filter, ISO 800, f/4, 360 sec. Single shot image. Taken by Bum-Suk Yeom on December 9, 2018 UTC @ Jangsu, South Korea. Details: 15:09 UTC (00:09 December 10 KST), Samyang 135mm f/2 ED UMC lens with EOS 5D Mark III camera, SkyGuider mount, Optolong L-Pro filter, ISO 3200, f/4, 3 x 90 sec. 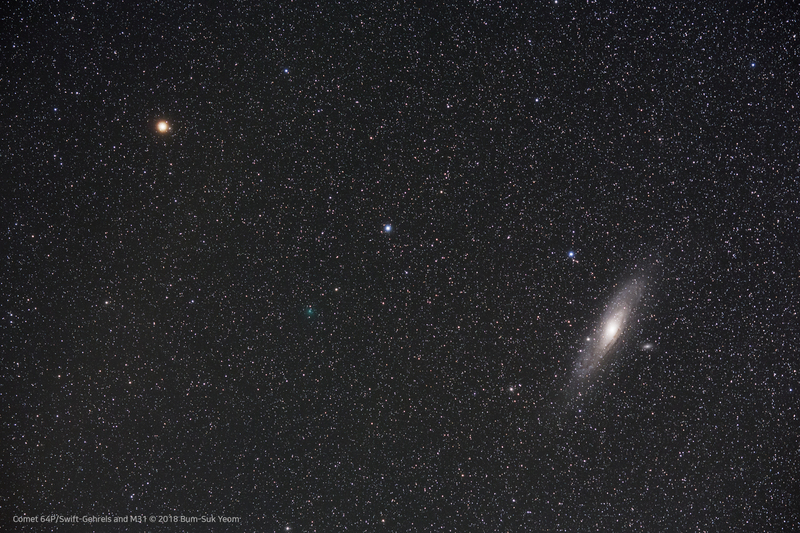 Comet 64P/Swift-Gehrels and Andromeda galaxy (M31). Taken by Bum-Suk Yeom on November 4, 2018 UTC @ Jangsu, South Korea. Details: 16:49 UTC (01:49 November 5 KST), Samyang 135mm f/2 ED UMC lens with EOS 5D Mark III camera, SkyGuider mount, ISO 800, f/4, 4 x 240sec (total 16 min) stacked. 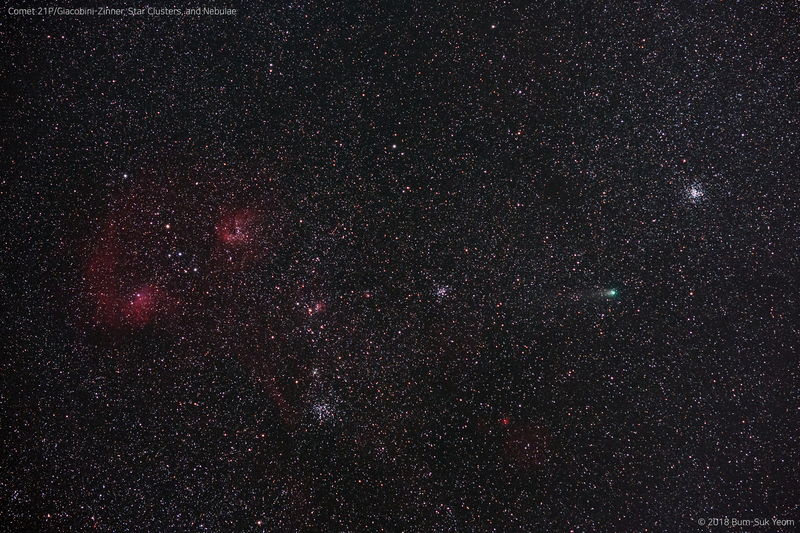 Comet 21P/Giacobini-Zinner, Star Clusters and Nebulae in the Auriga. 마차부자리의 산개 성단들(M36, M37, M38)과 성운들(IC405, IC410, IC417). Taken by Bum-Suk Yeom on September 9, 2018 UTC @ Jangsu, South Korea. 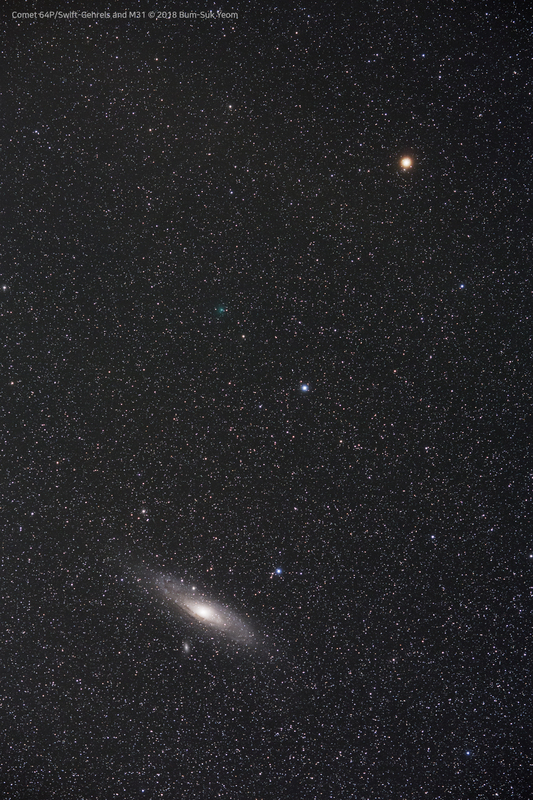 Details: 19:46 UTC (04:46 September 10 KST), Samyang 135mm f/2 ED UMC lens with EOS 5D Mark III camera, SkyGuide mount, Optolong L-Pro filter, ISO 1600, f/3.5, 4 x 90sec stacked. The brightness of a bright star near a comet is 3.9 magnitude. 혜성 옆에 있는 밝은 별의 밝기는 3.9등급입니다. Taken by Bum-Suk Yeom ( www.cometsky.com ) on March 03, 2017 UTC @ Sancheong, South Korea. Details: 18:17 UTC (03:17 Mar. 04 KST), Meade 14" ACF telescope with EOS 5D Mark III camera, LX850 mount, ISO 12800, f/8, 3 x 30 sec. Comet 45P/Honda-Mrkos-Pajdusakova & Crescent Moon. Taken by Bum-Suk Yeom on December 31, 2016 UTC @ Sancheong, South Korea. 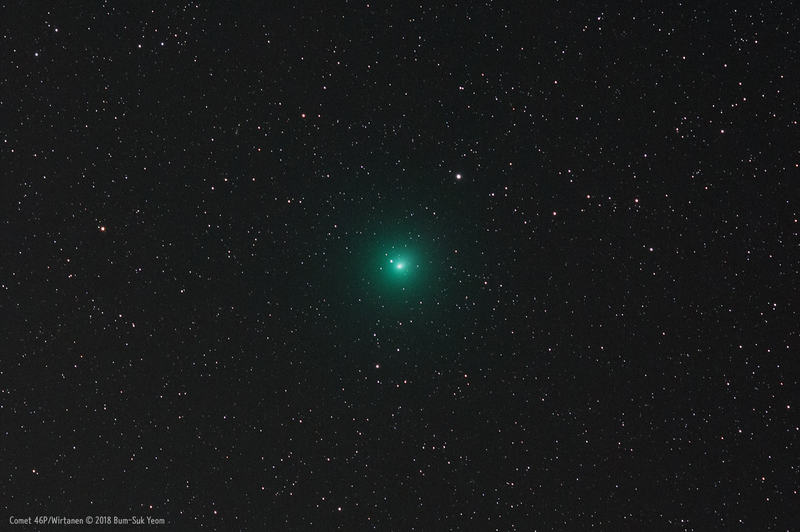 Details: 09:58 UTC (18:58 Dec. 31 KST) Nikkor 105mm (F2.0) lens with EOS 6D camera, EM-200 mount, ISO 800, f/5.6, 30 sec x 2. Comet NEOWISE (C/2016 U1). 11.1 mag. Comet NEOWISE (C/2016 U1) shows off a round fuzzy coma in the greenish light of diatomic carbon gas fluorescing in sunlight. 네오와이즈 혜성( C/2016 U1). 11.1 등급. 네오와이즈 혜성의 녹색은 혜성의 얼음 핵을 둘러싼 가스들에 기인한 것이다. 제트들은 아마도 시아노겐 (Cyanogen, CN)과 2가의 탄소 (diatomic carbon, C2)를 포함한 혜성의 핵(core)으로부터 분출한다. 이 두 물질들은 우주의 거의 진공 상태에서 태양빛에 노출되었을 때 녹색으로 빛난다. 이 두 물질은 통상적으로는 무색의 가스들이지만 태양빛에서 강력한 자외선에 의해 자극되었을 때 녹색을 보여준다. Taken by Bum-Suk Yeom on December 10, 2016 UTC @ Sancheong, South Korea. Details: 21:01 UTC (Dec. 11. 06:01 KST), Nikkor 300mm (F4) lens with EOS 5D Mark III camera, Meade LX850 mount, ISO 3200, f/5.6, 150 sec x 3 = 7.5 min. Comet Johnson (C/2015 V2) and the Whirlpool Galaxy (M51). comet 11.2 mag. and M51 8.1 mag. 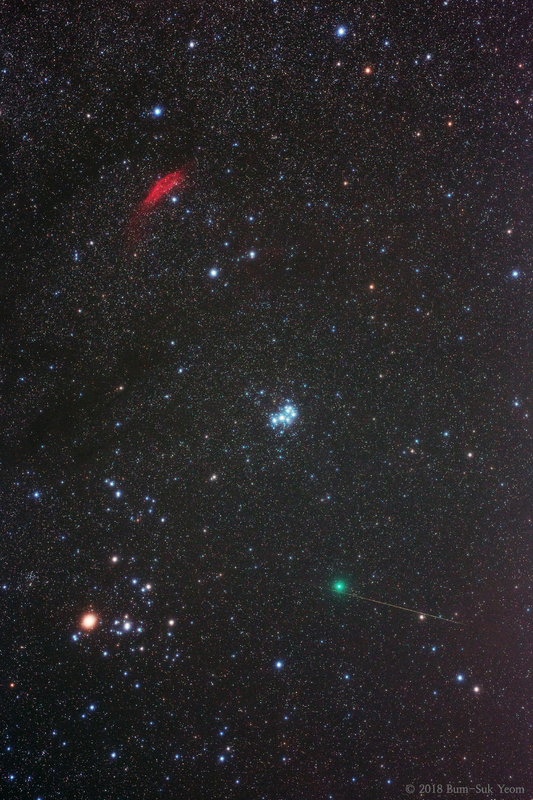 Comet Johnson (C/2015 V2) can be seen near the center of the left. 존슨 혜성( C/2015 V2)과 소용돌이 은하 (M51). 혜성은 11.2 등급과 M51은 8.1 등급. 존슨 혜성은 왼쪽 중앙 부근에서 볼 수 있다. Taken by Bum-Suk Yeom on December 10, 2016 UTC @ Sancheong, South Korea. Details: 20:23 UTC (Dec. 11. 05:23 KST), Nikkor 300mm (F4) lens with EOS 5D Mark III camera, Meade LX850 mount, ISO 3200, f/5.6, 180 sec x 4 = 12 min. 작년 12월에 촬영한 사진. 광해가 좀 있어서 그런지 혜성 꼬리가 잘 나타나지 않네요. 혜성 꼬리가 잘 나오도록 과하게 이미지 보정을 했습니다. Taken by Bum-Suk Yeom on December 11, 2015 (UTC) @ Nonsan, South Korea. Details: 20:00 (UTC, 05:00 Dec. 12 KST), Nikon 300mm (F4) lens with EOS 5D Mark III camera, Vixen Guide pack, f=300mm, f/5.6, ISO 3200, 60 sec x 8 = 8 min. 2016년 새해 첫번째로 촬영한 천체 사진. 반달이 떠 있고 대전 도심(대전시민천문대)에서 촬영을 하니 혜성의 꼬리는 나오지가 않네요. Taken by Bum-Suk Yeom on December 31, 2015 (UTC) @ Daejeon, South Korea. Details: 19:00 (UTC, 04:00 January 01, 2016 KST), FRT 128mm refractor with EOS 5D Mark III camera, Showa mount, f=1040mm, f/8.1, ISO 1000, 60 sec x 3 = 3 min.